So did anybody ever try EPP , the stuff football helmets and car bumpers are lined with … We’ve flown many EPP RC electrics over the years , but never CL and there’s where it’s TOUGHNESS would really shine … we could have simple bounces instead of Lawn Darts … It takes a LOT to damage EPP, and it can be hot wired into wings and shapes .. It comes usually in Black or white and in several weights /density . Re: Crash proof 1/2A Stunt plane … ??? While a locally designed plane, might I suggest the 'Man-Win' trainer. I have 3 of them and are decent little fliers. They really take a beating and besides a broken propeller, the only other thing I have had to do is re-bend the engine and mount back into pace. Easy and cheap to make. Wow!!! Those look Cool !!! Thanks !!! What type of planes have you been flying? Poor flying planes will compound the problem when learning. Do you have a CL club around you? Naturally after all these years we’re attracted back to CL again because of it’s Simplicity … and Fun !!! I feel you can't beat a foamie combat wing. Phil Cartier Lil Hacker even with a Black Widow takes considerable punishment. No landing gear with these but easy enough to fabricate if needed. 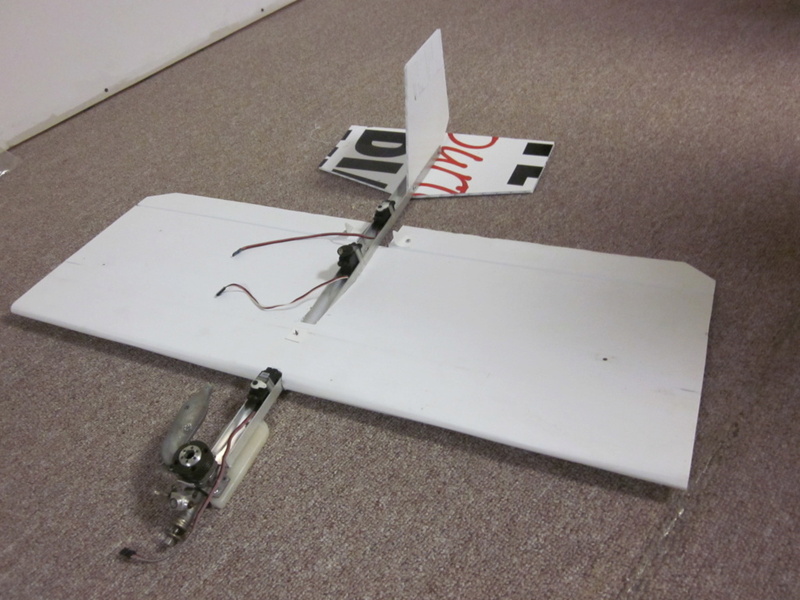 In addition, it's light enough to do the maneuvers and can be made even lighter. To learn the pattern or even parts of it, it's critical to learn inverted flight. Once you've learned it without crashing, all of the maneuvers are much easier to do. A crash proof plane isn't really necessary. A plane that's easy to repair is. Even the Sig Skyray is a simple plane that does inversion and a considerably decent amount of maneuvers. It does have some shortcomings and the nose easily breaks off. This can be fixed quite easily prior to the carnage. If the room is there to fly, learning to fly inverted and doing maneuvers is far easier on a .35 size plane. The speeds and reaction times are slower which is what many need to feel comfortable. Forgot to add to my above post. 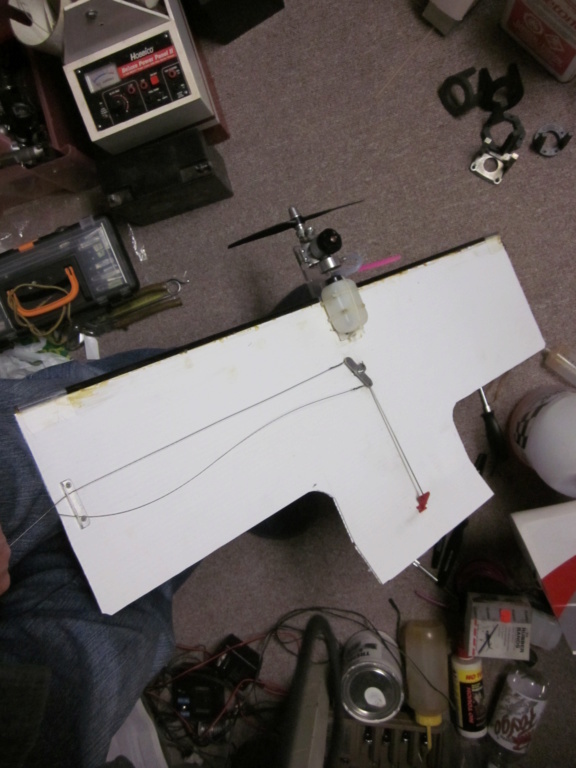 The plane I linked to does fly well with a Babe Bee and 35 foot lines (just old thick string I had laying around), but really fly much better using spectra fishing lines or steel cables. Add a Black Widow, and it wakes up even more! i still have my little coroplast 1/2A that predates the Manwin probably. I also made one for a .15. They are both a bit mushy, and the wings bend a scary amount when doing loops and stuff. Certainly won't do squares. I retired the .15 size one. The carbon fibre leading edge broke, but nothing else. The horn broke on the 1/2A one, but that was because it was 20 years old. Let's say they are crash resistant. I have seen the F2D planes hit really hard, and do ok. Midairs-NO. 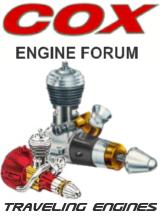 With a normal motor in, they will not hit as hard as the Foras and still perform well. I found that the EPP foam seems a bit too flexible without some good spars. Hey there aspeed. 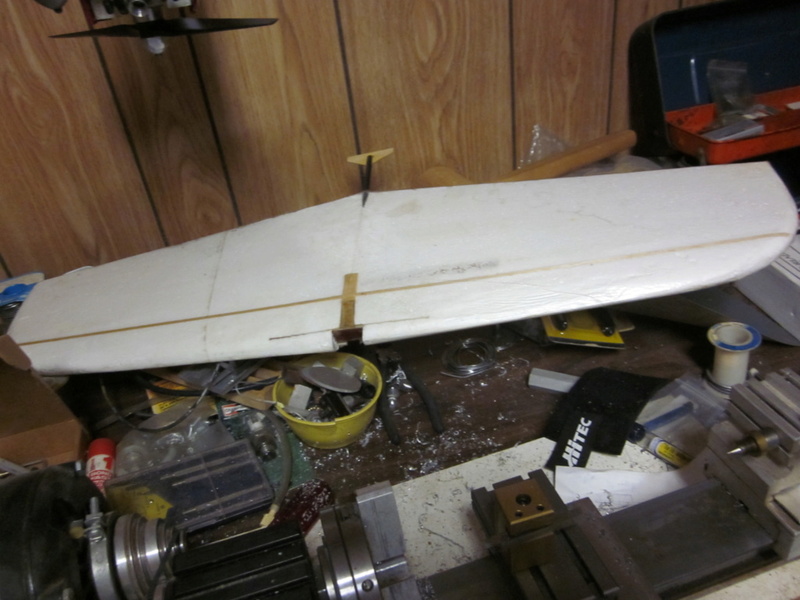 Did you happen to put a dowel inside the wing a little bit back from teh leading edge. Actually, in mine, I just put a BBQ skewer in so it sits in teh middle and have had no problems myself. 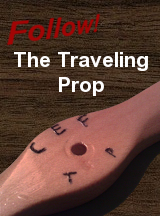 Heck with such minimal weight, you could even put one in the first flute as well. Also, if you do not mind, could you please give me dimensions of the .15 sized one? Is it just one layer, or is it doubled? I would like to try a bigger one, but would like something that is proven like yours. Thank you. I can't find the .15 one. I threw most of it out, and the wife used the coro part in front of the BBQ to catch the grease, and it seems to have blown away. I made it from a tracing of an F2D combat plane but it flexed a fair bit, so I cut it down smaller to the approximate dimensions of a Junior Satan. Maybe 24" x 9" + the tail/elevator. I just used some carbon fibre tube and taped and PU glued it on the leading edge. The motor mount broke once. It was the cutting board stuff. Then I used Lexan because I have a big boxfull. It vibrates a lot before takeoff, making lots of bubbles in the fuel line, but once in the air it is fine. I think the 1/2A one is tougher. A real plane flies much better. They both wallow a bit when you pull out of a loop. I didn't use a BBQ skewer, I used piano wire. It was a bit bigger than 1/8" diameter and fits snug. Just one layer of 4mm coro. 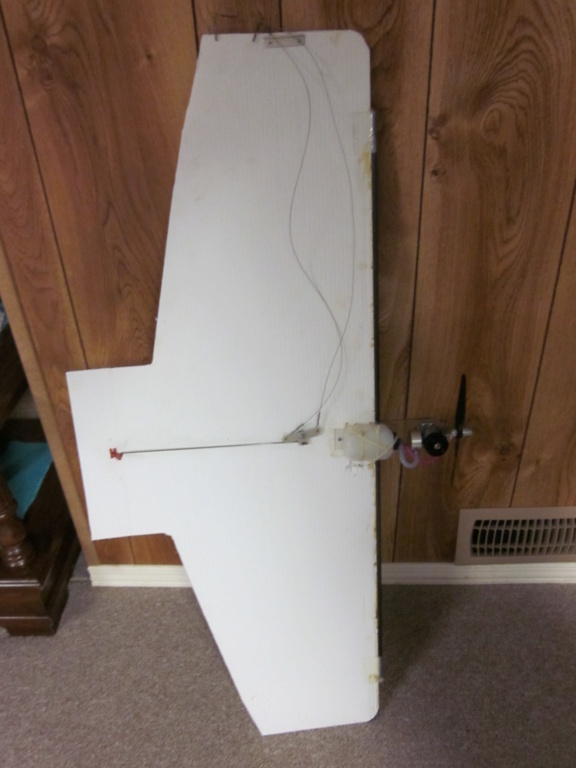 Maybe a real airfoil and spar with the 2mm coro would fly better if not too heavy. This pic was the first try. Thank you. I at least kind of have something to go on now. 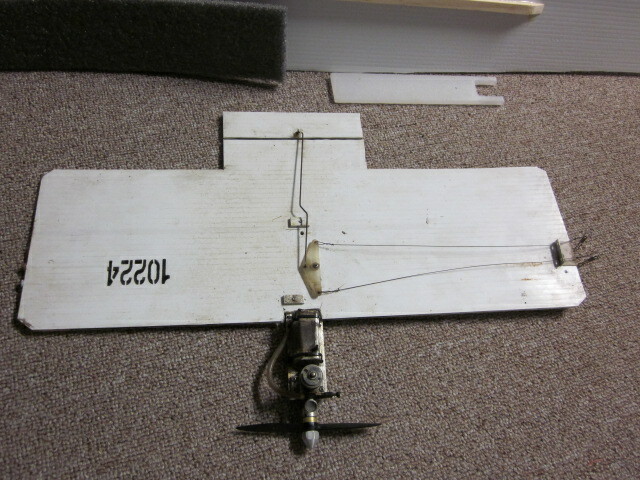 Just try the usual 10 to 20% balance,point by getting the motor mount the right length, and the leadouts about half way back on the wing and you won't be too far off. Bring some tin snips to the field to try ECOs (engineering change orders) I put a couple nails in the right wing for tip weight. If you get them near the leading edge it will maybe toughen the tip a bit. That is where it usually crumples a bit. Wow!!! You guys really have a great “handle" on things !!! Some really interesting ideas !!! Lots to experiment with ? 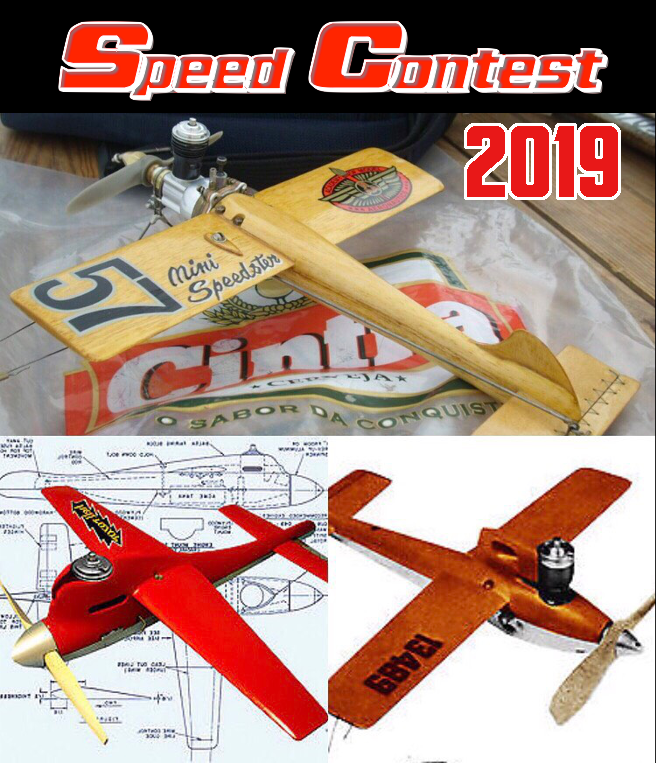 There is an RC SPAD Gnat with a similar airfoil. I have made one but it is not quite done. They don't really fly great from what I have seen, at least on the glide they just fall out of the air. I made up a control line combat with a KF airfoil using a spar and some EPP foam on the leading edge, but didn't even finish it as it seemed awful heavy compared to the standard built up type. The spar was pretty heavy too. I did get it more complete than the pic here. That isn't a servo arm, I made it from 1/16" aluminum. All of it isn't shown behind the spar which was just placed there for the pic. 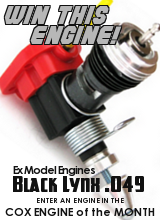 You can get bellcrank packages with a few sets for cheap from MBS (Model building supplies. Melvin Shuette) http://mbsmodelsupply.com/Catalog.pdf Hobby shops are almost non existant now. Many don't carry fuel, none carry engines in stock, you are lucky to find a propeller around here. I think I used a nut that was the thickness of the corro, and cut a hole through the top layer of the corro, and drilled and tapped the motor mount for the bolt. 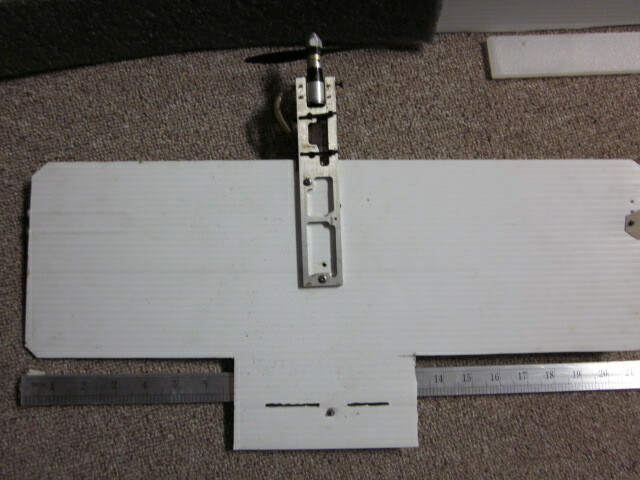 Added a few more bolts with big aluminum 1/8" rectangles that were drilled and tapped to hold the wing down. I think the blue fanfold has a plastic bonded on one side, so the fuel will not soak through. 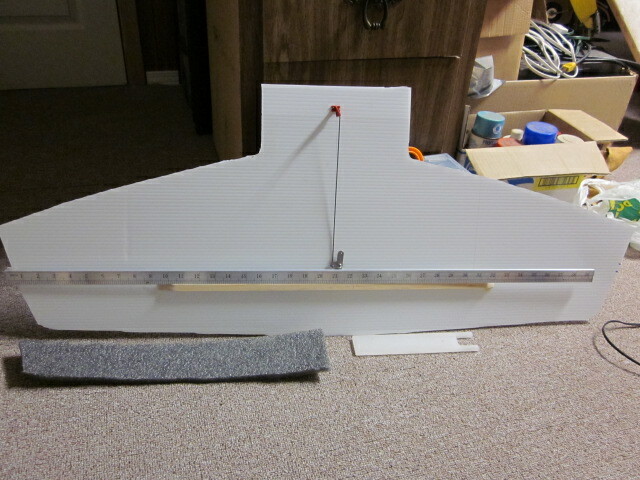 I bet I could break the fanfold easier than the corro, but it is actually pretty light, maybe lighter than balsa? I am not sure where to get the blue fanfold any more. Lowes stopped carrying it. I think some siding places may sell it, but the price is higher than it was at Lowes. I got a big piece when they discontinued it, but now it could be $50 instead of $35. It is a lifetime supply though, and what is left over will help insulate your house LOL.